BIOGRAPHY Lieutenant Colonel John E. Mann, a distinguished 33-year veteran of the U.S. Army, has been awarded more than thirty U.S. and foreign decorations. They include the Silver Star, three Legions of Merit, three Bronze Stars and the Distinguished Flying Cross. Mann served as a Special Forces advisor in Vietnam during 1963-64 and later as a battalion commander in 1969. He was a member of the historic 555 th Parachute Infantry Battalion, the first all black paratroop unit, known as the "Triple Nickles," and made 168 jumps as a paratrooper over a period of 17 years airborne service. After retirement, he authored four detective novels. 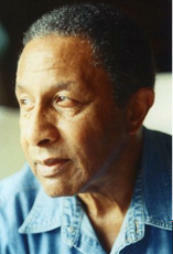 Mann was born March 24, 1926 in Camden, South Carolina to Otis and Helen Mann. The couple had no other children. Mann graduated from Mather Academy in 1944, was drafted into the Army shortly afterwards at age 18 in October 1944. To further his education, Mann took college courses in the evenings and in 1966 he received a BA in History from Park College in Parkville, Missouri. In 1976 he was awarded a Masters degree from the University of Oklahoma. Mann also graduated from a number of military schools while in the service, including the Company Grade Officers Course, Motor Officers Course, Paratroop and Glider courses (all at Fort Benning, Georgia) and the Command and General Staff College at Fort Leavenworth, Kansas. Upon graduating from high school, Mann reported to Fort Banks, Massachusetts for his induction into the U.S. Army. He was then transferred to Fort McClellan, Alabama, a segregated training facility, staffed by white officers, for basic training. After basic training, Mann was selected as cadre (drill sergeant) where he trained troops for combat. Shortly after the war ended in Europe, he was transferred to Fort Benning, Georgia, the home of the Airborne School. Although he had seen a film of airborne training previously, and was impressed with the paratroopers' appearance, the manner in which they carried themselves, plus the duty appeared to be exciting. It was here that he had his first opportunity to see his first black paratrooper. 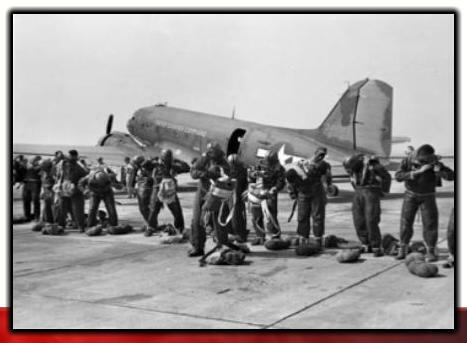 He volunteered for paratroop training but his application was not forwarded, because he was considered, "essential personnel." Since his term of service was about to end, he was discharged and then re-enlisted for airborne duty in early 1947 with the 555 th Parachute Infantry Battalion, known as the Triple Nickles. It was the first and only all black battalion that served during World War II. Although Mann was not part of the inaugural units, he had the distinguished honor of serving with the organization prior to its being integrated into the 82 nd Airborne Division and becoming the 3 rd Battalion, 505 th Airborne Infantry Regiment. Shortly after the Korean War began, Mann was sent as a part of a cadre to the 11 th Airborne Division at Fort Campbell, Kentucky to help replace units from the division that had been shipped to Korea. He became a company First Sergeant at 24 years of age and later received a direct commission as a Second Lieutenant. Mann served as a First Lieutenant in the closing months of the Korean War and was given the command of a company in the 3 rd Infantry Division. Upon his departure, he was awarded his first Bronze Star. Later, he was assigned again to the 11 th Airborne Division and while serving on a peace-keeping mission during the Cold War in Germany, was sent to Lebanon in 1958. His company secured a hill overlooking the Beirut Airport and guarded the American Embassy residence. Later, the company moved to the olive grove in the vicinity of the Airport and conducted patrols. He was promoted to Captain while in Lebanon. After completing special forces and counter-insurgency training, Mann was assigned to 1st Special Forces Group (Abn) on Okinawa, and sent as a detachment commander to Vietnam to train Hamlet Militia and to establish a camp in Bien Dinh Province. He conducted one of the first heliborne operations in country by securing the new camp-site while the remainder of his "Strike- Force" came by vehicle over land. Later he was instrumental in preventing an uprising when one of the three Montagnard Companies left the camp without approval of the camp commander. Mann went after the force and was able to return the troops back to the camp the following day. Mann returned to Vietnam in 1968 and served on the Division Staff in the 25 th Infantry division and later as battalion commander. He saw considerable combat and earned numerous medals and commendations for his valor in battle. After his service in Vietnam, Mann returned to a job in the Pentagon as an executive officer in the Warsaw Pact division (DIA) until 1973. He was next sent to The Netherlands to serve as commander of the American Army troops assigned to Allied Forces Central Europe headquarters. (NATO) Unfortunately, his wife, Grace died of cancer while they were there. Mann returned to the U.S. in 1977 and finished his last year of service at Fort Lesley J. McNair in Washington, DC before retiring as a lieutenant colonel. 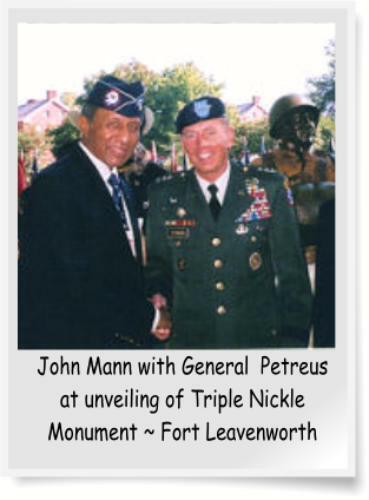 In 1978, Mann met with former members of the Triple Nickles at Howard University to plan their first reunion that would take place at Fort Bragg, North Carolina in 1979. Since then, they have had a reunion practically every year. As a civilian, Mann was appointed County Personnel Officer for Prince George's County Maryland, from 1979-1981, before taking a position as business manager of Glenelg Country School in Howard County Maryland. Mann married his second wife, Jean, in 1987 and retired from Glenelg Country School in 1991. After attending a seminar at his local library in the early 1990s, Mann joined Sisters in Crime, a fiction, mystery writing group. Since 2003, Mann has published four books based on the fictional character, Joe Kepper, a former paratrooper, turned police detective: The Search for Rosita (2003), Peril in Parksdale (2004), Angelo's Guest (2007), and Early Joe Kepper (2009) . 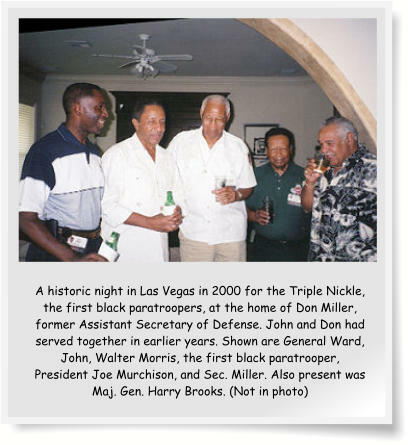 Mann continues to maintain and promote the legacy of The Triple Nickles paratroopers through annual reunions, and correspondence with formal members. He also talks to groups upon request. He has visited Graterford Prison in Pennsylvania, which has a chapter of Vietnam Veterans of America who were interested in America's first black paratroopers (the prisoners presented him with a plaque) and more recently he spoke to cadets at the Naval Academy in Annapolis. John E. Mann is a freelance writer published in a number o0f national magazines and newspapers. He has also been honored with several poetic achievement awards. John is a graduate of Park College and holds a Masters Degree from the University of Oklahoma. He has also completed writing courses with Long Ridge Writers Group in West Redding, Connecticut. John is a retired Army officer who has been awarded more than thirty US and foreign decorations. They include The Silver Star, three Legions of Merit, three Bronze Stars and the Distinguished Flying Cross.